The necklace in the above photo is from Lauren Nicole Gifts. This is the sterling silver wax seal initial necklace. You can get your initial stamped onto the front and there are many styles of font to choose from including the Victorian font you see above. You can even choose to have your full initials stamped onto a charm. There are several chain length options to choose from so that you can get this necklace made for anybody young or old. The necklace that I chose came with an 18" rolo chain, wax seal initial charm and then three additional 6mm beads in the colors of my children's birth months. The necklace chain had an easy to use clasp, it was smooth feeling and did not catch on my skin or hair. The sterling silver chain and charm were very vibrant, delicate and exceptional. The detail of the stamping onto the wax seal charm was finely crafted. This necklace is a delight to the eyes, refreshingly original and is made to last a lifetime. The only thing that I would change is the chain length. I think I would prefer a much longer chain, the 18" felt too small for me. Another thing worth noting is the nice gift box that the necklace came in, it's really pretty with the logo and elastic ribbon. Check out mine below and enter to win one of these very special necklaces for yourself. 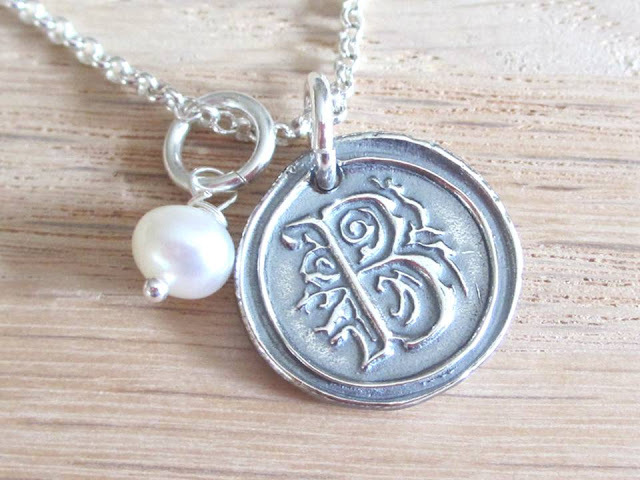 One very lucky winner will receive one sterling silver wax seal initial charm measures 3/4" in diameter and comes on an 18" sterling silver chain with a freshwater pearl. (top photo) Giveaway will end on 9/5 @ 12:01 am. US only.